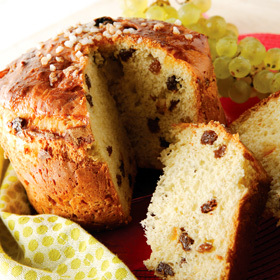 A delicious festive sweet bread and traditional way to celebrate Christmas in Italy! Mix the flour, salt, sugar, butter, egg yolks and orange blossom water in a bowl. Blend with a spatula for 2 minutes and add the pieces of candied orange and dried raisins. Mix again until you have a smooth dough and finish by kneading with a rolling pin. Shape the dough into a ball, put it back in the bowl and cover with a cloth. Leave to rest for 60 minutes in a warm place. Take the ball of dough, divide it into 2 equal pieces and leave to rest, covered, for 10 minutes. Shape the dough into 2 cakes, place them on a baking sheet and leave to rest, covered, for 2 hours. Put the balls of dough into special Panettone paper moulds. Brush them with the beaten egg and sprinkle with granulated sugar. Put the Panettones in an oven pre-heated to 180°C and bake for 40 minutes.